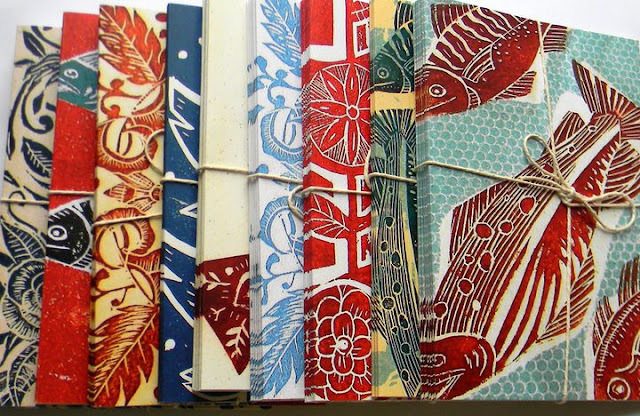 This header photo is a shot of packs of notecards by Amanda Colville, of Mangle Prints. Well to make up for my tardiness with the last post, I am leaping ahead to pop another one on-line for you. These two little books arrived via Amazon the other week. The first I had read DECADES ago, when we began to get interested in self sufficiency, whole foods, and growing things. I desperately wished to be Elizabeth West in her Welsh hillside cottage, striking out from the tame mediocrity of suburbia (though I don't think I fancied her husband, he doesn't come across as a very encouraging or supportive type of chap!) I lost sight of the book until Pam over at her blog "A good life in Tydd", mentioned it in a post and I was instantly transported. Onto Amazon and I find a source to buy from, and also found the other book with all the recipes in. Bonus. And they cost me about thruppence-h'appenny! Deep joy! Some other books which have been claiming my attention at the moment! I'm really having a go at sketching, though I am beginning with copying to be more accurate; I have great difficulty drawing from life, so I am hoping that just getting that drawn line on the paper will exercise that 'drawing muscle' and it will over time get a bit easier. But I have been carving blocks -oh, I do love carving! The top plate is the carving I did at Amanda's workshop last week; I have been tidying it up, carving away the extraneous lines, much happier with it now. The plate below I carved over the weekend. I stamped on the lino block with my trout stamp, and carved out the text - in reverse - and added the border. I've done a test print, using stamping ink, in order to see where it might need tidying up. Looking forward to printing this properly and making some cards. This is a speedball rubber block which I'm currently carving. The design is one I made for a small stitched textile - you can see the appliqued flower and a few buttons . This was harder to get my head round which bits were to be carved away - it's quite plain to see now that I've done most of it, but before I started I had to work out which was background fabric and which was appliqued fabric, and the top and bottom borders threw me a curved ball! Such enjoyment to be had, just slicing away, bit by bit, SO addictive! If you haven't already read it the previous post shows lots of photos of the prints we made at the workshop. You can also see more on Facebook : Mangle Prints, hop across and check out Amanda's work. I haven't been neglecting my stitching. Here are the samples I am making for the sampler workshop at Bradfield's in Heacham, and the cushion cover, where the text is driving me to distraction! I couldn't let the arrival of my new little chair go un-blogged! Here it is, just a little chair, nothing flash, but very comfortable, and already my back is aching less with NOT sitting with my legs underneath me. It's greener and pinker than it appears in the photo, and I'm looking forward to being able to ring the changes with perhaps recovering the seat and back cushions at a later date. On the subject of furniture, here a a few shots of our cd rack, which Jim made for me years ago, and I decoupaged. It is actually full of cds we neither of us listen to very much - all my favourites are in my sewing room (or my car!) and Jim has his near his fly-tieing desk. But I do like to look at the rack, which harks back to a time when our cottage was decorated with LOTS of colour. I decoupaged an old sideboard in similar fashion, but this now lives with Katy in her new home in France so I can't show it to you. However, if you stroll down the garden with me to the garage I can show you another piece I did. It's an old cut down kitchen table we found in a junk shop, which we cleaned up and used for a coffee table for years. However, with the arrival of Jim's recliner, it was took up too much space so here it languishes, getting cold and dusty. 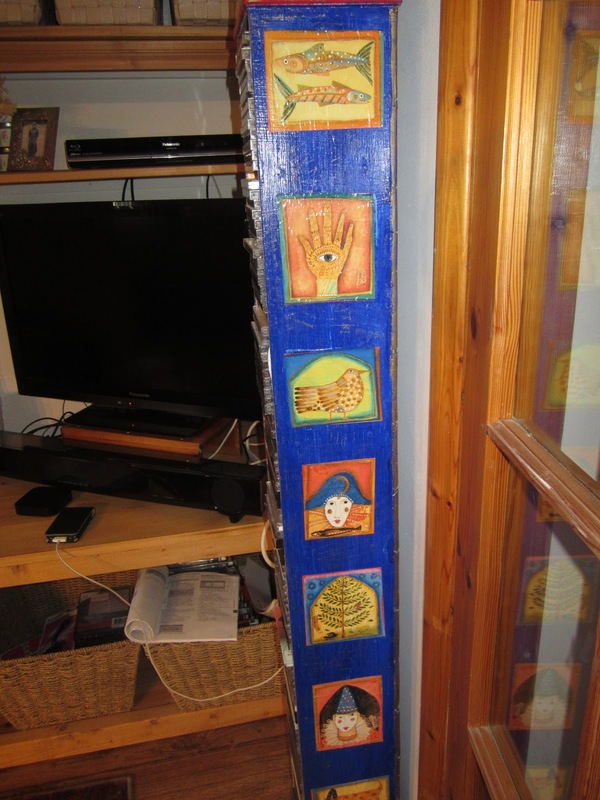 I do have plans for it though, now that the living room is better arranged - I may be able to sneak it back in; it will need to be sanded down and repainted . Come on summer - I need some sunshine and warmth to work outside! Hi Ethel, thanks for popping by. I should have made the text more evenly spaced - I did pencil it in first but it was difficult to see. Ah well, Hopefully as I go round I can slightly budge it up a little. Love the new chair and the decoupage work, is it Jane Ray paper? What a great carving workshop it was Lynne !!! Hi Els, lovely to hear from you, it was indeed a fantastic day - with long lasting repercussions! Hi Jane, you know that book seems to be striking a lot of chords with people - either they've read it or it reminds them of their earlier exploits. What with the slow food movement, grow your own, and the crsft revival the spirit of the 60's lives on! carving looks great. Love the thread your doing the lettering with, lovely mix of coloours. Thanks Gill, trying not to do too many things at once! Gosh those Elizabeth West books took me back a bit! I had both of them at one time but haven't seen them in ages. I loved the tale she told but sadly I think they had to give it all up in the end. Your sewing and chair as well as the lino cuts look really interesting. Thanks Sarah, my inks arrived today, and some more lino blocks ....watch this space!! I also read Hovel in the Hills years ago and recently bought and passed it on but also kept the recipe one. When I did a stint of textiles in college (only a few years ago) we were taught by Sarah Pink and one of the lovely books she showed us was Creating Sketchbooks. I read it from cover to cover and it really helped me - as did she. A lovely and inspirational lady. Hi Dc, and yet another one! `So you read it too, incredible. Wow you've been busy, you put me to shame I'm barely keeping my head above water with normal life!! The carving looks great and I love the chair. Hello Jay, thanks for popping by - love your blog by the way! Now come on, apart from giving a bit of support to my mum, I'm pretty much a free agent - you have a young family and all that entails. No way could I have been doing all this when our boys were young and at home - or even when the grandchildren lived closer (New Zealand is a l...o....n.....gggggg way away!) Every cliche you ever heard about retirement is true - how did I have time to go to work, Ive never been so busy since I retired etc etc . The only thing that I find now is that I wish I'd started to do these things years ago - still, you've got to start somewhere. Lynne, so much in this post! The notecards in your header were immediately eye catching - just fabulous. I love the decoupage, your patchwork chair... and am really intrigued about the Creating Sketchbooks book - I have put it on my wish list. Your embroidery samples are charming, from what we can see in your photo. And btw, my husband fly fishes and ties flies as well;). Hi Cynthia, aren't those notecards wonderful? Amanda is so talented, I so glad I took the workshop with her.